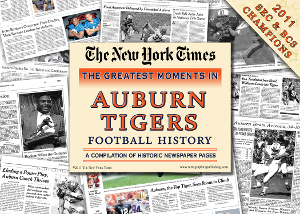 Own your very own piece of Auburn Tigers Football including 2011 SEC & BCS Champions with this Greatest Moments collectible newspaper from The New York Times. These are Genuine New York Times reprints that come in a full size newspaper format with pages of New York Times coverage including a Special Color Section. Each Page Measures: 15W x 22L inches. Terrific memorabilia addition or gift idea for the avid sports fan in your life !